A blog offers your business a number of benefits, from search engine optimization, to brand awareness, gaining credibility in your field, to generating awareness of your topic or cause. It is, without a doubt, one of the most powerful ways to market your business online. But a successful blog doesn’t happen by a stroke of luck. It doesn’t happen quickly, and it doesn’t happen without a plan. Whether you are just getting started with a blog or are looking to refresh the one you have, a good best practice is to create a marketing plan for your blog. What is a blog marketing plan? A blog marketing plan is a way to organize your thoughts and develop clear, measurable goals for your blog. This is especially helpful if you have multiple people contributing to your blog, because it keeps everyone on the same page. All of your blog contributors can understand its purpose, and develop valuable content that align with your blog’s goals. Just as you need a business plan for your business, you need a marketing plan for your blog. Beginning a blog without one is like trying to drive a car with your eyes closed. You have no idea where you are, where you are going, how to get there, or why you are on the road. A plan keeps you focused and organized, and provides a clear roadmap to accomplishing your goals. A blog marketing plan does not have to be complicated. If fact, the simpler it is, the better and more effective it will be. If it is short and helpful, your team will be more likely to refer to it as your blog launches and grows. It won’t be shoved into a file folder and forgotten about like what sometimes happens with other plans you prepare for your business. Goal. Every blog should have a clearly defined purpose. Your goal could be to increase brand recognition, present yourself as an expert in your field, or drive traffic to your website. It could be all of those things, and maybe a few more. Identifying your goal or goals helps everyone understand the desired result. Target Audience. It’s important to identify who your audience is, so you can tailor your blog content accordingly. Spend some time thinking about the age, gender, location, and psychological traits that make up your target audience. Keep that audience in mind when you write your blog articles. Call to Action. Every blog should ask your reader to take action, and your call to action may vary from blog article to blog article. That’s okay. Your “ask” could be to fill out a form, click on a link or download an ebook. Asking for the next step is an effective way to begin a relationship with your audience, and move them through the buying cycle. Approval Process. 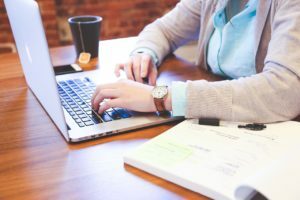 If you have multiple people contributing to your blog, you may want to select someone to oversee all of the content, edit for spelling and grammar, and establish a publishing schedule for the blog. The owner of the company may want to read the blogs before they are published. Ask questions upfront so everyone is comfortable with the process of developing content and getting it posted to your site. Frequency/Length. Determine how long your blogs will be (for example, under 300 words, 500-700 words, over 2500 words, etc.) and how often you will be publishing them to your website. The more you can blog the better, but commit to what you can do consistently. Promotion. How are you going to get the word out about your blog? You may choose to add a subscription form to your blog so your followers receive an email whenever you publish a new post. Or you may promote it through social media or an email marketing campaign. Adding social share buttons to your blog allows your readers to share your post with their followers. Measuring Success. It’s important to know how well your blogs are performing, and which topics engage your readers. You could use a tool like Google Analytics to evaluate web traffic, or track email opens through your email marketing program. You could also evaluate the number of likes, shares and comments on the social media updates that promote your blog posts. Developing a plan is a necessary first step to any new project, and it begins with collaboration and organization. Once you have established a blog marketing plan, your team can work toward your blog’s growth and success.